The land that in time would become Lindsay’s Beach was once pasture owned by John Parker and Julia Lindsay. Lyndol “Lyndy” Palin owns this section of land. This is an article I wrote several years about Lindsay’s Beach in Derby. Born on December 19, 1829 in Derby, Vermont, John Parker Lindsay went on to become a respected inventor and manufacturer of metal products who, according to his obituary, had close ties with President Abraham Lincoln’s administration, and at least loose ties to the president himself. Lindsay held a number of patents, including for at least two firearms, a pistol and a rifle, specially designed for use by Union forces in the Civil War and Indian warfare. In 1884, after his long career in which he lived, worked and traveled the northeastern United States, Lindsay retired home to his roots in Derby. His wife, Julia, joined him in his childhood community. On October 29 of that year, the couple bought a house and barn, along with 60 acres of land off of what today is the Darling Hill Road in Derby. More than 125 years later, the house still stands. It is now owned by David and Jo Ann French. The Lindsays’ land has long been subdivided and sold. Homes have sprung up where there were once only farm fields. A few descendants of John and Julia Lindsay still own some of the original acreage along Lake Memphremagog. One parcel of the Lindsays’ property, an acre and a half piece on the shores of the lake, is owned by Lyndol “Lyndy” and Evelyn (Bray) Palin. They live in what was John and Julia Lindsay’s lake house, located only a few yards from the lake, and about two miles from the Quebec border. Mrs. Palin is the great-granddaughter of John and Julia Lindsay. “When John Lindsay bought the land there was nothing on the beach,” Mr. Palin said. In researching town records, he has determined the Lindsays built the home in 1891; it first appeared on the tax rolls in 1892. While it is Mrs. Palin whose ancestral roots run deep on that piece of land, Mr. Palin, who has a keen interest in history, has spent countless hours researching and tracking the life of John Lindsay, including his ties to the Lincoln administration, and the mysteries of the Derby native’s involvement in the Civil War, apparently as a civilian. A subsequent article about these portions of Mr. Lindsay’s life will appear in a future issue of the Journal. “I think he was a fascinating fellow,” Mr. Palin said. John Lindsay died on April 13, 1892 , and Julia died in 1917. After their death the family homestead where they’d settled when they retired to Vermont, was sold. The rest of the property was divided up among their four children: Howard (Evelyn Palin’s grandfather), Walter, Will, and Adelide. It was this lakeside parcel of property that was eventually inherited by Evelyn Palin, which went on to bring so much joy to people from near and far. 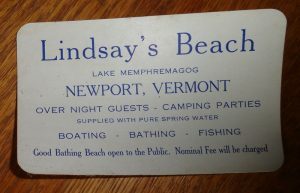 For upwards of three decades, Lindsay’s Beach was open to the public, including hosting public swim lessons for area young people. 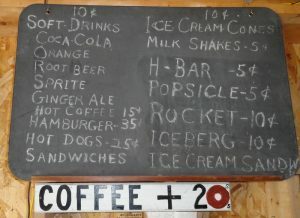 It was owned by Howard and his wife, Alice (a native of Orford, New Hampshire). Howard worked aboard the trains as a border officer. Because the railroad tracks passed by yards from the lakeside home, the passing train would slow enough for Howard Lindsay to board the train to do his job for the remainder of the day, Mr. and Mrs. Palin said. 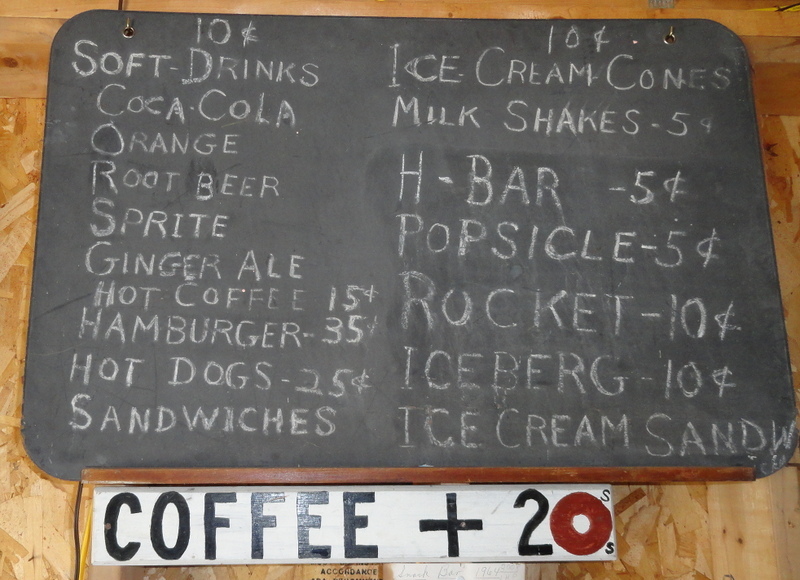 There was even a snackbar at the beach. Although the Palins haven’t been able to conclude the exact year that Howard and Alice Lindsay decided to transform their home into a lakeside destination, they believe it was in the early 1930s. 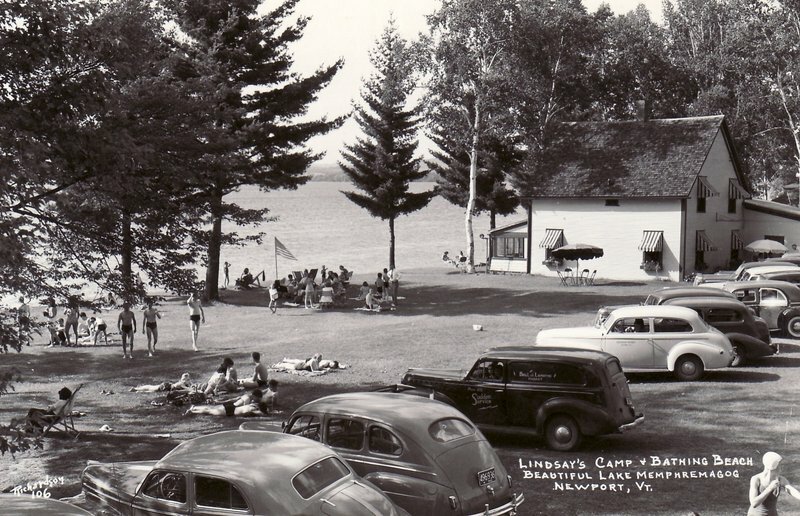 By the early 1940s the summer camp had been turned into a tourist home for vacationers. Born in 1924 in New Jersey, Evelyn Palin, the daughter of Fred and Dorothy (Lindsay) Bray, has been coming to the family’s ancestral property her entire life. That is where her father, who worked on Wall Street, took the family on his vacations. “I started coming here as a baby in a carriage,” Mrs. Palin said. Her mother, Dorothy (Lindsay) Bray, was the daughter of Howard and Alice Lindsay who by then owned the property. Mrs. Lindsay, along with her brother, John Park Lindsay (named after his grandfather), were born in John and Julia Lindsay’s home, which is now owned by the Frenches. 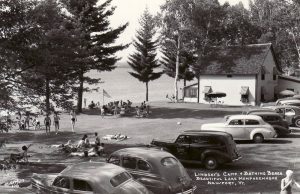 Lindsay’s Camp and Bathing Beach, or more commonly known as Lindsay’s Beach, was far more than a swimming hole for locals. Yes, locals flocked to the beach, but so did people far from the Northeast Kingdom. 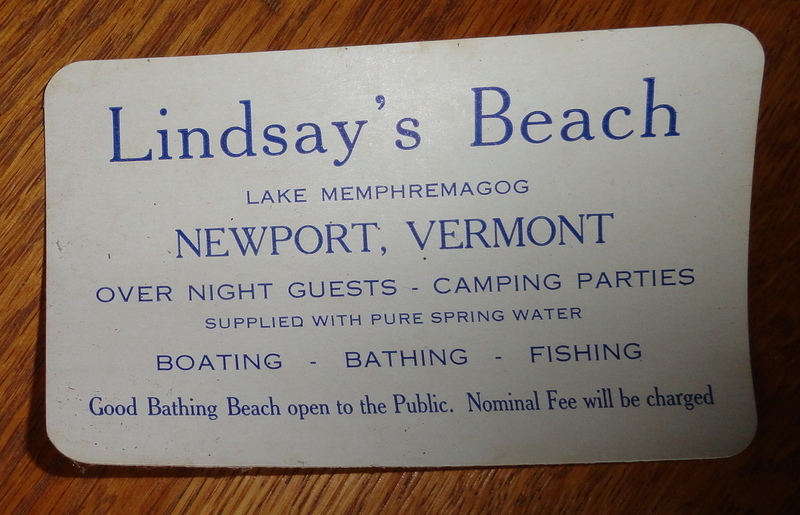 Howard Lindsay’s involvement in the lodging and recreation area was short-lived. He died in 1941, a few years after it was open to the public. The Palins told how Mrs. Lindsay apparently was born with the hospitality business in her blood. Among the local establishments she worked in was the eloquent Newport Hotel, which was located on Main Street. She worked there as a hostess. And the story in the family is she met the man who would become her husband, Howard Lindsay, while working at an establishment in Barton. At first the couple simply opened the property up to swimmers, but in time, likely after Howard Lindsay’s death, she rented out the lodge (what is now the Palins’ home) to guests. There were often ten to 12 guests in the house at a time, and there were only two toilets, and one clawfoot bathtub with no shower. “Can you imagine all those people from New York and around staying here with only one bathtub?” Mrs. Palin said. Meanwhile, she said Mrs. Lindsay, her cook, and waitresses slept in what was called the bunkhouse, a building located a few steps from the house. The building has long since been torn down and replaced with a garage. Another building which contained male and female changing rooms and toilets has also been torn down. Local people also came to swim at the beach by the dozens. On a hot, sunny day, they said 30 to 40 cars covered the lodge’s lawn. Many families brought along picnic lunches, and swim lessons were held there for area children, particularly from Derby and Newport. From as far back as she could remember, Mrs. Palin said her family visited Lindsay’s Beach. When she became a teenager she spent the entire summers there, not only as a vacation, but because her mother, who contracted polio, wanted to keep her daughter, who was her only child, from suffering the same fate. She figured she could do that by sending her daughter to live in rural Vermont during the summer and not stay in urban New Jersey. During those long summer stays she worked as a waitress in the lodge. It was during one of those summer stays she met the man who has now been her husband for 67 years. They met at the International Dance Hall, which was located off of Sias Avenue in Newport. “I was just out of high school and he was waiting to go into the military,” Mrs. Palin said. “I saw him. We danced, and that was it. It was love at first sight.” Mr. Palin was eventually called up by the Army Air Corps. He served as a pilot of a B-17 bomber, taking part in dangerous bombing missions over Nazi occupied Europe. They married following the war on May 26, 1945. The passage of time took a toll on Mrs. Lindsay, the Palins said. Although her heart was in her work, her age was making it difficult for her to keep up the fast pace of running the beach, lodge, and feeding the guests. She didn’t close the establishment all together, at least at first. Instead, although guests still came to stay in the lodge, she no longer cooked and provided meals for them. They were essentially on their own. However, come the early 1960s, at more than 80 years old, Alice Lindsay, who spent her winters in Boca Raton, Florida and shuttered the lodge in the winter, close the establishment to the public for good. After Alice died in 1967, the lodge was shuttered up for a few years while the family struggled to figure out what would become of it. Left unused, the Palins said time was not good to the building. It quickly fell into disrepair. Once the estate was settled, the lodge passed down to Mrs. Palin. At that time the couple refurbished the building, but without robbing it of its character. Living in the Burlington area at the time, they began renting it out during the summer months on a weekly or biweekly basis. In 1995 the Palins retired to the lodge where they live full time. One hundred and twenty years after John and Julia Lindsay built their lake house, Mr. and Mrs. Palin, who are parents to five grown children, grandparents to 11, and great-grandparents to 12, are hoping that their children keep their little piece of that original property in the family for future Lindsay descendants to enjoy. However, with days of their lives marching on, they plan to leave that decision up to their children. Please consider subscribing to Vermont’s Northland Journal, a monthly magazine dedicated to sharing and preserving the history of Vermont’s Northland Journal. Click HERE to learn how to subscribe. On Monday, there will be a solar eclipse. The following are memories of the 1932 as I have recorded in the Northland Journal over the last 15 years. Many of the people interviewed for this article have since passed. Although only eight years old in 1932, the year people living in the Northeast Kingdom could view the total eclipse of the sun, Olive (Urie) Griffin of West Glover remembers hearing about the eclipse that would eventually darken the sky on August 31 of that year. Mrs. Griffin and her husband, Ray, said the eclipse was big news in the days leading up to it. There was talk about it on the radio, and people were anxiously talking about it amongst each other. “We put smoke on our glasses by holding them over the woodstove,” Mrs. Griffin said. “Then we went out on the back porch and watched the eclipse. We were in awe of it all.” She told how the people of the region had been educated about various ways to watch the eclipse while at the same time protecting their eyes from harmful rays. She suspects smoking one’s glasses was one of the methods. So many decades later, Mr. Griffin told how during the minute or two the height of the eclipse lasted, those who were putting hay in the barn stopped everything and stood on the high drive which led into the barn and watched the eclipse. The eclipse was big news in the region, Chet Carpenter of Newport said. He was 12 years old and living in Derby in 1932. Carpenter recalled how a group of astronomers set up their equipment on what was the Kingsbery Farm Golf Course, located off of what is now Route 111 in Derby. “They set up on the golf course because there weren’t any trees to get in the way,” he said. However, he said there was little they could do when the clouds rolled in that day and obscured their view of the eclipse. Carpenter has no problem remembering where he was when the eclipse began. “We were reaping the grain up on the hill,” he said. “When it started we stopped the team and watched the eclipse. We just watched it without anything to protect our eyes. Guess we were dumb or didn’t know better. It didn’t last very long. It was pitch dark for just a short time.” His eyes suffered no ill effects from watching the eclipse without eye protection. (NOTE- watching the eclipse with unprotected eyes is not recommended). At 98 years old Ruth Austin of Newport was a senior at Newport High in 1932. She was at home on Spring Street in Newport during the celestial event. She attributed her lack of excitement to the fact that she was a teenager and didn’t have time for something of so little importance as a solar eclipse. However, she said she appeased her parents and went outside to watch the phenomena, and she is glad she did. “It became dark outside, but it was only dark for a couple minutes,” Mrs. Austin said. Thinking back to the eclipse, she wishes she had paid more attention to it, especially since she’d never live to see another one. The following interviews were recorded by this writer in 2002. “I was in my grandmother’s yard at the time of the eclipse,” Harold Nunn recalled. He also remembered anybody, including himself, wanting to watch it to look through a piece of glass made smoky over an oil lamp. Nunn speculated this was done in an attempt to block out harmful solar rays while at the same time allow them a view of the eclipse. At the height of the eclipse he said the sky was very dark. He, too, recalled the sky being momentarily dark at the pinnacle of the eclipse. Thinking back to August 31, 1932, Roland Devost of Norton remembered exactly where he was and what he was doing when the sky turned dark. He was harvesting a field of grain in Norton. The eclipse wasn’t a surprise to most people, Devost said. Although there wasn’t any television to inform the public as the day of the eclipse neared, he said the newspapers kept people updated. When it started to get dark, the birds started flying to get into their night cover,” he laughed as he told how confused the birds must have been when, only a few minutes later, the sky again grew light. Unlike many others of the time, Ruby (Petelle) Jenness said the eclipse took her family by total surprise. Not only didn’t they have a TV, but they didn’t have a radio or regularly buy a newspaper. She said she was 11 years old and living in Holland when the sky darkened. Her family wasn’t the only ones surprised by the sudden darkness. The darkness sent the family’s chickens, which were given free run around the family’s property, into a tizzy. “They streaked to the chicken house squawking all the way,” Jenness laughed. Once the eclipse was over, and the sunlight reappeared, the chickens came out of their chicken house, and Jenness’ parents breathed a sigh of relief that the world wasn’t coming to an end after all. The following article is from an August 1932 issue of the Orleans County Monitor. 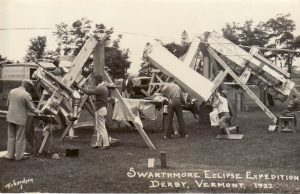 On Tuesday of last week Prof. John A. Miller of Swarthmore College contracted with Kingsbery Farms, Derby, to care for his expedition party of astronomers and attendants numbering about 30 people. For over a year, ever since last summer, the Kingsbery Farm management has been working on getting this attraction for the community. Dr. Slocum of Vleck Observatory, Middletown, Conn., made a scouting trip into Orleans County, following the eclipse line into Canada as well as through Maine and New Hampshire. Of course there have been many towns competing for this expedition, and it is real good fortune that this community is to have it. It will mean that the territory will be visited by motorists from a radius of 150 miles including Vermont, New Hampshire, and Quebec. It requires about a month’s preparation for Dr. Miller and his assistants to get ready for the 90 seconds of the total eclipse. A 60-foot tower for the holding of the telescope and camera lenses will be erected on a segregated part of the golf course between the ninth and first fairways. Around this tower will be built the working laboratories, dark rooms, and mechanical shops incident to the preparation. The materials and builders have been arranged for and work will start immediately. The instruments are all set on cement foundations to a depth of eight feet in the ground to get away from any road tremors or explosions from surrounding quarries. The following article appeared in the Orleans County Monitor in the days following the August 31, 1932 solar eclipse. The eclipse of the sun on Wednesday afternoon of last week both thrilled and disappointed thousands of local and visiting persons, depending upon their exact location. Low hanging clouds in splotches made the final totality period of the eclipse visible and invisible to groups of persons only a very short distance apart. In Barton Village for instance some sections saw the totality period complete without obstruction while others saw none of it. The same was true in Orleans. In general, those who journeyed to such places as Sheffield Heights and Brownington Heights were disappointed while those who stayed at home in the villages saw the most beautiful sight of all—the few seconds of totality when the corona flashed out. “The totality shadow raced through skies half filled with big, slow moving clouds that kept onlookers on the anxious seat fearing the sight of a life time would be blotted out. This was just what occurred in many places including the location of the Swarthmore expeditioners. A vision of the eclipse was gained at intervals but when the totality came, low hanging clouds acted like a curtain and disappointment came to hundreds gathered there. Using special equipment they hoped to obtain pictures of the solar corona at many diameters larger than it has been pictured before. For the last 15 years, the Journal has been the only magazine dedicated to sharing and preserving the history and heritage of the Northeast Kingdom. The monthly magazine is filled with stories of the Kingdom from an earlier time as told by the people who lived it. Each issue is also filled with historic photos of the region. The Journal comes in print and electronic versions.